How can a book with only 112 words be so satisfying? 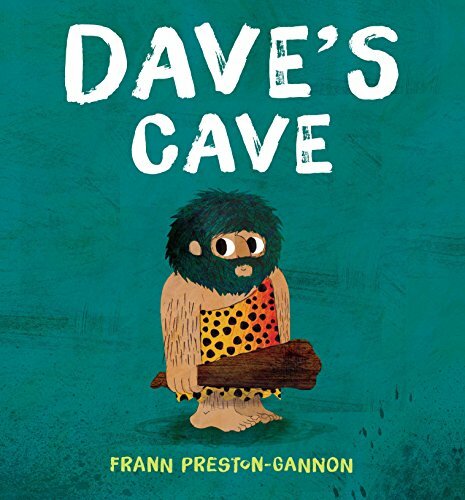 In Dave’s Cave, Frann Preston Gannon tells the story of a cave man who believes that the grass is always greener on the other side of the fence. He goes out in search of a better cave. Gannon’s Cro Magnon man, who looks like a cross between Fred Flintstone and Big Foot, talks like a cave man. “Dave like cave. . . . But Dave not happy.” Gannon keeps up the cave man talk throughout the story, using only five verbs: finds, want, put, go, and like. The rest of it sounds like grunting as Dave goes from cave to cave looking for the perfect spot. Dave’s cave needs to have green grass and comfy rocks. The modern-day squirrel and bird follow him from place to place in search of the perfect home. The book seems simple, but Gannon makes it hilarious with her spare text and modern touches placed around Dave’s world. His squirrel friend roasts a marshmallow, Dave’s hobo cloth at the end of his club is polka dotted, and he carries his Home Sweet Home sign with him. He finally hangs it on the wall next to the primitive cave drawings, which include a self-portrait along with scratchings of a bird and a squirrel. The bird sits on Dave’s lap in one spread, and the squirrel sleeps on Dave’s stomach in another. On the first page, the bird is perched on Dave’s head. Dave’s eyes show curiosity, distress, wonder, fear, surprise, sadness, and joy. Jon’s eyes show anger. Primary colors dominate on a gray background with lots of white space. The teal cover and the orange end papers frame the book, while pops of the two colors appear throughout. Children will enjoy looking at the art while hearing the story. The last pages have clues that Dave has seen the cave before: evidence of a campfire, sooty footprints heading off the page to the right while Dave comes in from the left, and a sign-shaped bare spot on the cave wall. Upon further inspection, children might also see the graffiti in one corner: Dave woz ere! Gannon’s first page is a T. S. Eliot quotation, which is strangely sophisticated for a children’s book and contrasts with the crude language skills of a cave man. Dave’s Cave is more than it appears to be upon first reading. It’s one of those books parents will love. It is short, yet satisfying, and a reminder that there really is no place like home.